Imagine you are a snake. You’re crawling along the path, with a long slithering body behind you. You have no ears and, even if your eyes are large and well-developed, you cannot blink. You’re constantly flicking your tongue, which informs you about everything that has happened around you, especially about the smell of that tasty mouse you’ve been looking for for days. Ophidians have suffered so many bodily modifications that their senses have had to adapt to their lifestyle. With more than 3,000 current snake species it’s difficult to generalize, but in this entry we’ll explain some of the most curious sensorial adaptations of current ophidians, trying to shed some light over the world of these fascinating and unfairly treated animals. One of the most developed ophidian senses is smell. It’s common knowledge that snakes use their tongue to smell the air and detect chemical substances. It was once thought that snakes used only their tongue to smell and that the nasal epithelium was only used to activate this mechanism. Now it’s known that snakes smell using both their nose and their tongue, even if the latter is more useful in certain situations. Microscope image of a transversal slice of a snake skull, where we can see the olfactory epithelium of both the nasal cavity and the vomeronasal organ. Image by Elliott Jacobson. Snakes taste the air using their tongue and the vomeronasal or Jacobson’s organ. This organ isn’t found only in snakes, as it is also found in other lizards, some salamanders and many mammals. The vomeronasal organ is used to detect non-volatile chemical substances (which need direct contact with the epithelium to be detected) such as pheromones or the scent of a prey. Scheme of the position of the vomeronasal organ. This forms during the embryonic development from the nasal cavity and it has an opening to the palate. Image by Fred the Oyster. The snakes’ distinctive bifid tongue is very specialized into particle transport to the vomeronasal organ. It has a set of microscopic papillae or depressions (depending on the species) that help to catch and retain odorous particles. Then it brings this information to the palate, where it gets in contact with the vomeronasal organ. Monitor lizards (relatives of snakes) also present bifid tongues which allows them to smell the air. Photo of an Asian water monitor (Varanus salvator) from India, by Dibyendu Ash. Snakes flick their tongue in the air or against some surface to collect “chemical samples” from the environment. Also, the fact that the tongue is bifid is thought to be useful in detecting the direction from where the stimulus comes, as the information obtained from each tip of the tongue goes to one of the two cavities of the vomeronasal organ and goes to the brain by separate ways. Photo of a European grass snake (Natrix natrix) flicking its tongue to taste the air. Image from WikiImages. Snakes use this chemical information to follow the trail of a prey, to find a mate and to detect the reproductive state of another individual. Also, a recent study shows that snakes (thanks to their keen sense of smell) are able to recognize their siblings and relatives, choosing them before a stranger to share their hibernation grounds. Hearing is one of the least developed ophidian senses. The absence of an external ear caused that for a long time it was believed that snakes were deaf. Yet recently, it has been demonstrated that snakes do have different methods to detect different types of vibrations. Portrait of an Indian python (Python molurus) in which the absence of external ears can be seen. Photo by Holger Krisp. As we explained on an earlier entry, snakes do not have neither external ears nor eardrums. Yet, they do present all the elements of the inner ear characteristic of tetrapods. What changes is the way the vibrational stimulus is transmitted, which in ophidians is accomplished via a bone called columella. 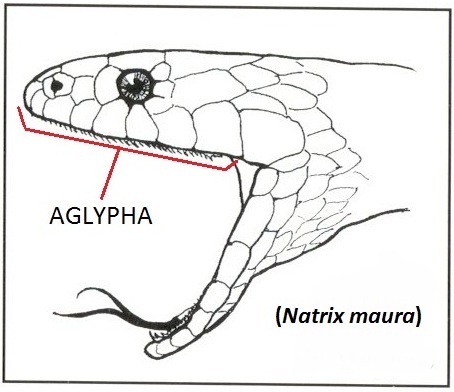 Scheme of the auditory apparatus of a common snake. Image by Dan Dourson. The columella is a small, long and thin bone attached by ligaments and cartilaginous tissues to the posterior end of the upper jaw and that articulates with the lower jaw. Snakes have one on each side of their skull, which have an equivalent function to the stapes (bones of the mammalian middle ear). The columellas are completely surrounded by tissues, so aerial, terrestrial and aquatic vibrations, are transmitted to these bones which are in contact with the fluids of the inner ear. Yet, the snakes’ sensitivity to aerial waves is pretty much limited. For example, while human beings are able to hear aerial vibrations between 20 and 20,000 Hz, snakes can only detect vibrations between 50 and 1,000 Hz. Even though they have such limited hearing range, in some species it has been observed that they are able to receive vibrational stimuli with any body part, as these are transmitted through the bodily tissues to the columellas. Aquatic snakes like the anaconda (Eunectes murinus) can detect with all their body the sounds of an animal moving through the water. Photo by Ddouk. Even with their limitations to hear aerial waves, what snakes do best is to detect vibrations coming from the ground or the water. Most snakes can detect with great precision vibrations generated by the steps of a prey by keeping their lower jaw (which is in contact with the columellas) in contact with the ground. The Arabian horned viper (Cerastes gasperettii) is a snake that lives in sand deserts, where the terrain allows a great transmission of terrestrial vibrations. Image by Zuhair Amr. The eyes of snakes are not very different from the eyes of most terrestrial vertebrates. Yet they have some special characteristics, probably due to their subterranean or subaquatic origins. Most scientists think that snakes had to somehow “reinvent their eyes”. Some primitive ophidians, like this European blind snake (Typhlops vermicularis), have small and poorly-developed eyes. Image by Kiril Kapustin. The structure of their eye is mostly identical to that of the rest of tetrapods. A difference is the focusing method: while most tetrapods focus by changing the curvature of the crystalline lens, snakes focus moving the crystalline lens forward and backward. Also, while most terrestrial vertebrates have eyelids to protect the eye, snakes have an ocular scale called the spectacle which is renewed each time they shed their skin. Western rat snake (Pantherophis obsoletus) about to shed its skin, moment when the spectacle turns opaque. Photo by Bob Warrick. Depending on the snake’s lifestyle, its sight will have different adaptations, even if in most species the retinas present both rods (sensitive to low light conditions) and cones (allow to see details and colours). Subterranean, more primitive snakes present quite simple eyes, with only rods which allow them to distinguish light and darkness. On the other hand most diurnal snakes have round pupils and both cones and rods. Many arboreal snakes like this green vine snake (Ahaetulla nasuta) present horizontal pupils which allow them to have a wider range of vision, making it easier to calculate the distance between one branch and another. Photo by Shyamal. Aside from visible light, some snake are able to see other wavelengths. Pit vipers and some pythonomorphs (pythons and boas) can detect infrared radiation, being able to see the thermic signature around them. This is extremely useful to detect prey in low light conditions, as they can perceive their body heat. Photos of a python and a pit viper where both the nostrils (black arrows) and the pit organs (red arrows) are highlighted. Image by Serpent nirvana. They can do this using the pit organs, cavities that appeared independently in pit vipers (from which they got their name) and pythonomorphs. While pit vipers only have a pair of facial pits on both sides of their snout, pythonomorphs have various labial pits on the upper or the lower lip. Despite having fewer pits, the pit vipers’ ones are more sensitive that the ones of the pythons. Scheme of the structure of a pit organ of a pit viper. This presents a membrane sensible to temperature variations, behind which there’s a chamber with air and nerves sensible to heat. This air dilates when the temperature rises and it activates the trigeminal nerve. Image by Serpent nirvana. These pits are extremely sensitive and can detect temperature changes of up to 0.001°C. The trigeminal nerve reaches the brain via de optic tectum, making the image detected by the eyes superpose with the infrared image from the pits. Therefore snakes detect both the visible light (as we do) and the infrared radiation in a way that is impossible for us to imagine. Video from BBCWorldwide in which they explain how a timber rattlesnake (Crotalus horridus) uses infrared detection to hunt a rat in the dark. As you have seen, snakes perceive the world very differently than we do. Snakes do not leave anyone indifferent and, in the same way that different people see snakes in different ways, different ophidian species present different and diverse adaptations to perceive the world that surrounds them. We hope that with this entry, you’ve been able to understand a little better the incredible world in which snakes live. Harvey B. Lillywhite (2014). How snakes work. Structure, function and behaviour of the world’s snakes. Oxford University Press. Cover image by Bernard Dupont. Imagina que eres una serpiente. Te arrastras arras de suelo, con un cuerpo largo y delgado detrás. No tienes orejas y aunque tus ojos son grandes y están bien desarrollados, no puedes parpadear. Constantemente sacas la lengua, cosa que te informa de todo lo que ha pasado a tu alrededor, especialmente el olor del suculento ratón que llevas días buscando. Los ofidios han sufrido tantas modificaciones corporales que sus sentidos han tenido que adaptarse a su estilo de vida. Con más de 3.000 especies actuales de serpientes es difícil generalizar, pero en esta entrada explicaremos algunas de las adaptaciones sensoriales más curiosas de los ofidios actuales, intentando arrojar algo de luz al mundo de estos animales tan fascinantes e injustamente tratados. Uno de los sentidos más desarrollados de los ofidios es el olfato. Es sabido que las serpientes utilizan la lengua para oler el aire y detectar sustancias químicas. Antes se creía que las serpientes sólo utilizaban la lengua para oler y que el epitelio nasal solo servía para activar este mecanismo. Ahora sabemos que las serpientes huelen utilizando tanto la nariz como la lengua, aunque ésta les es más útil en determinadas situaciones. Imagen de microscopio de un corte transversal del cráneo de una serpiente, en la que se ve el epitelio olfativo, tanto de la cavidad nasal como del órgano vomeronasal. Imagen de Elliott Jacobson. Las serpientes prueban el aire mediante la lengua y el órgano vomeronasal u órgano de Jacobson. Este órgano no es exclusivo de las serpientes, ya que se encuentra también en otros lagartos, algunas salamandras y en muchos mamíferos. El órgano vomeronasal sirve para detectar sustancias químicas no volátiles (que necesitan contacto directo con el epitelio para ser detectadas) como por ejemplo feromonas o el rastro de una presa. Esquema de la posición del órgano vomeronasal. Éste se forma durante el desarrollo embrionario a partir de la cavidad nasal y tiene una apertura al paladar. Imagen de Fred the Oyster. La inconfundible lengua bífida de las serpientes está muy especializada en transportar partículas al órgano vomeronasal. Ésta presenta un seguido de papilas o depresiones (dependiendo de la especie) microscópicas que ayudan a la captación y retención de partículas olorosas. Después lleva esta información hasta el paladar, donde entra en contacto con el órgano vomeronasal. Los varanos (parientes de las serpientes) también presentan una lengua bífida que les permite oler el aire. Foto de un varano acuático (Varanus salvator) en la India, de Dibyendu Ash. Las serpientes sacan la lengua al aire o contra alguna superficie para recoger “muestras químicas” del ambiente. Además, se cree que el hecho de que la lengua sea bífida les sirve para detectar mejor la dirección de donde viene el estímulo, ya que la información que obtienen de cada punta de la lengua va a una de las dos cavidades del órgano vomeronasal y viaja hasta el cerebro por vías separadas. Foto de una culebra de collar (Natrix natrix) sacando la lengua para probar el aire. Imagen de WikiImages. Las serpientes utilizan esta información química para rastrear presas, buscar pareja y detectar el estado reproductor de otro individuo. Además, en un artículo reciente se ha estudiado como las serpientes (gracias a su sentido del olfato) eran capaces de reconocer a sus hermanos y familiares, escogiéndoles ante un desconocido para compartir sus refugios de hibernación. El oído es uno de los sentidos menos desarrollados de los ofidios. La falta de oído externo hizo que durante mucho tiempo se pensase que las serpientes eran sordas. Aun así, recientemente se ha comprobado que las serpientes sí que tienen diferentes métodos para detectar diferentes tipos de vibraciones. Retrato de una pitón de la India (Python molurus) en el que se ve claramente la ausencia de oído externo. Foto de Holger Krisp. Como ya comentamos en una entrada anterior, las serpientes no presentan ni oído externo ni tímpanos. Aun así, sí que presentan todos los elementos del oído interno característicos de los tetrápodos. Lo que cambia es el método de transmisión de los estímulos vibracionales, que en los ofidios se lleva a cabo mediante un hueso llamado columella. Esquema del aparato auditivo de una serpiente cualquiera. Imagen de Dan Dourson. La columella es un pequeño hueso largo y delgado que está atado mediante ligamientos y tejidos cartilaginosos a la parte posterior de la mandíbula superior y se articula con la mandíbula inferior. Las serpientes tienen una a cada lado del cráneo y realizan una función equivalente a los estribos (huesos del oído medio de los mamíferos). Las columellas están completamente envueltas de tejidos de manera que las vibraciones, tanto aéreas como terrestres o acuáticas, son transmitidas a estos huesos, los cuáles se encuentran en contacto con el líquido del oído interno. Aun así, la sensibilidad de las serpientes a las ondas aéreas es bastante limitada. Por ejemplo, mientras que los seres humanos podemos oír vibraciones aéreas de entre 20 y 20.000 Hz, las serpientes sólo detectan vibraciones entre los 50 y 1.000 Hz. Aún y teniendo un rango auditivo tan limitado, en algunas especies de serpientes se ha visto que el aparato auditivo puede recibir estímulos vibratorios de cualquier parte del cuerpo, ya que éstos se transmiten a través de los tejidos hasta las columellas. Las serpientes acuáticas como la anaconda (Eunectes murinus) pueden detectar con todo el cuerpo los sonidos de animales moviéndose bajo el agua. Foto de Ddouk. Aún con las limitaciones que tienen para detectar ondas aéreas, lo que se les da mejor es detectar vibraciones provenientes del suelo o del agua. La mayoría de serpientes pueden detectar con gran precisión la vibración causada por los pasos de una presa apoyando la mandíbula inferior (que está en contacto con las columellas) al sustrato. La víbora cornuda arábica (Cerastes gasperettii) es una serpiente que vive en desiertos arenosos, donde el terreno permite una gran transmisión de vibraciones terrestres. Imagen de Zuhair Amr. Los ojos de las serpientes no difieren mucho de los del resto de vertebrados terrestres. Pero sí que tienen algunas características especiales, debido seguramente a sus orígenes subterráneos o subacuáticos. La mayoría de científicos creen que las serpientes por decirlo de algún modo, tuvieron que “reinventar sus ojos”. Los ofidios más  primitivos, como esta serpiente ciega europea (Typhlops vermicularis), tienen ojos pequeños y poco desarrollados. Imagen de Kiril Kapustin. La estructura del ojo es prácticamente igual que en el resto de tetrápodos. Una diferencia es el método de enfoque que, mientras que en el resto de tetrápodos el ojo enfoca cambiando la curvatura del cristalino, las serpientes enfocan moviendo el cristalino adelante y atrás. Además, mientras que casi todos los vertebrados terrestres tienen párpados que protegen el ojo, las serpientes tienen una escama ocular transparente que se renueva cada vez que mudan de piel. Víbora ratonera (Pantherophis obsoletus) a punto de mudar de piel, momento en que la escama ocular se ve opaca. Foto de Bob Warrick. Dependiendo del estilo de vida de la serpiente su visión presenta adaptaciones diferentes, aunque en la mayoría de especies la retina presenta tanto bastones (sensibles en condiciones de poca luz) como conos (permiten ver los detalles y el color). Las serpientes subterráneas más primitivas presentan ojos bastante simples, con sólo bastones que les permiten diferenciar la luz de la oscuridad. En cambio la mayoría de serpientes diurnas presentan pupilas redondas con conos y bastones. Muchas serpientes arborícolas como esta serpiente látigo verde (Ahaetulla nasuta) presentan pupilas horizontales que les permiten aumentar su campo de visión, haciendo que puedan calcular mejor las distancias entre rama y rama. Foto de Shyamal. Aparte de la luz visible, algunas serpientes pueden ver otras longitudes de onda. Los crótalos y algunos pitonomorfos (pitones y boas) pueden detectar la radiación infrarroja, pudiendo ver la signatura térmica de su alrededor. Esto les resulta extremamente útil para detectar las presas en condiciones de poca luz, ya que pueden percibir su calor corporal. Fotos de una pitón y un crótalo donde se señalan tanto las narinas (flechas negras) como las cavidades termorreceptoras (flechas rojas). Imagen de Serpent nirvana. Esto lo consiguen mediante las cavidades termorreceptoras, unas cavidades que han aparecido independientemente en los crótalos y en los pitonomorfos. Mientras que los crótalos sólo presentan un par de fosetas loreales a ambos lados del hocico, los pitonomorfos presentan varias fosetas labiales en el labio superior o en el inferior. Aunque tienen menos, las de los crótalos son más sensibles que las de las pitones. Esquema de la estructura de la cavidad termorreceptora de un crótalo. Ésta presenta una membrana sensible a los cambios de temperatura, detrás de la cual hay una cámara con aire y nervios sensibles al calor. Este aire se dilata con los incrementos de temperatura y activa el nervio trigémino. Imagen de Serpent nirvana. Estas fosetas son extremadamente sensibles y pueden detectar cambios de temperatura de hasta 0,001°C. El nervio trigémino llega al cerebro vía el tectum óptico, haciendo que la imagen detectada por los ojos se superponga con la imagen infrarroja de las fosetas. Ésto hace que estas serpientes detecten tanto la luz visible (como nosotros) como la radiación infrarroja, de una forma que a nosotros nos resulta imposible de imaginar. Vídeo de BBCWorldwide en el que se nos explica como una cascabel de los bosques (Crotalus horridus) utiliza su detección de la radiación infrarroja para cazar una rata en la oscuridad. Como habéis visto, las serpientes perciben el mundo de forma muy diferente a la nuestra. Las serpientes no dejan indiferente a nadie y, de la misma forma que distintas personas ven a las serpientes de formas diferentes, las diferentes especies de ofidios presentan adaptaciones diferentes y diversas para percibir el mundo que les rodea. Esperemos que con esta entrada hayáis podido entender un poco mejor el increíble mundo en el que viven las serpientes. Imagen de portada de Bernard Dupont. Imagina’t que ets una serp. T’arrossegues arràn de terra, amb un cos llarg i prim al darrera. No tens orelles i tot i que els teus ulls són grans i estàn ben desenvolupats, no pots parpellejar. Constantment treus la llengua, cosa que t’informa de tot el que ha passat al teu voltant, especialment l’olor del suculent ratolí que fa dies que busques. Els ofidis han patit tantes modificacions corporals que els seus sentits s’han hagut d’adaptar al seu estil de vida. Amb més de 3.000 espècies actuals de serps és difícil generalitzar, però en aquesta entrada explicarem algunes de les adaptacions sensorials més curioses dels ofidis actuals, intentant portar llum al món d’aquests animals tant fascinants i injustament tractats. Un dels sentits més desenvolupats dels ofidis és l’olfacte. És sabut que les serps utilitzen la llengua per olorar l’aire i detectar substàncies químiques. Abans es creia que les serps només feien servir la llengua per olorar i que l’epiteli nasal només servia per activar aquest mecanisme. Ara sabem que les serps oloren fent servir tant el nas com la llengua, tot i que aquesta els és més útil en determinades situacions. Imatge de microscopi d’un tall transversal del crani d’una serp, on es veu l’epitel·li olfactiu tant de la cavitat nasal com de l’òrgan vomeronasal. Imatge de Elliott Jacobson. Les serps tasten l’aire mitjançant la llengua i l’òrgan vomeronasal o òrgan de Jacobson. Aquest òrgan no és exclusiu de les serps, ja que es troba també en altres llangardaixos, algunes salamandres i en molts mamífers. L’òrgan vomeronasal serveix per detectar substàncies químiques no volàtils (que necessiten contacte directe amb l’epiteli per ser detectades) com ara feromones o el rastre d’un presa. Esquema de la posició de l’òrgan vomeronasal. Aquest es forma durant el desenvolupament embrionari a partir de la cavitat nasal i té una obertura al paladar. Imatge de Fred the Oyster. L’inconfusible llengua bífida de les serps està molt especialitzada en transportar partícules fins a l`organ vomeronasal. Aquesta presenta un seguit de papil·les o depressions (depenent de l’espècie) microscòpiques que ajuden a la captacio i retenció de partícules oloroses. Després porta aquesta informació fins al paladar, on entra en contacte amb l’òrgan vomeronasal. Els varans (parents de les serps) també presenten una llengua bífida que els permet ensumar l’aire. Foto d’un varà aquàtic (Varanus salvator) a l’Índia, de Dibyendu Ash. Les serps sacsegen la llengua a l’aire o contra alguna superfície per recollir “mostres químiques” de l’ambient. A més, el fet de que la llengua sigui bífida es creu que els serveix per a detectar millor la direcció d’on ve l’estímul, ja que la informació que obtenen de cada punta de la llengua va a una de les dues cavitat de l’òrgan vomeronasal i viatja fins al cervell per vies separades. Foto d’una serp de collar (Natrix natrix) treient la llengua per tastar l’aire. Imatge de WikiImages. Les serps utilitzen aquesta informació química per a rastrejar preses, buscar parella i detectar l’estat reproductor d’un altre individu. A més, en un article recent s’ha estudiat com les serps (gràcies al seu sentit de l’olfacte) eren capaces de reconèixer als seus germans i familiars, triant-los abans que un desconegut per a compartir els seus caus d’hivernació. L’oïda es un dels sentits menys desenvolupats dels ofidis. L’absència d’oïda externa va fer que durant molt de temps es pensés que les serps eren sordes. Tanmateix, recentment s’ha comprovat que les serps sí que tenen diferents mètodes per a detectar diferents tipus de vibracions. Retrat d’una pitó de l’Índia (Python molurus) en el que es veu clarament l’absència d’oïda externa. Foto de Holger Krisp. Com ja vam comentar en una entrada anterior, les serps no presenten ni oïda externa ni timpans. Tanmateix, sí que presenten tots els elements de l’oïda interna característics dels tetràpodes. El que canvia és el mètode de transmissió dels estímuls vibracionals, que en els ofidis es duu a terme mitjançant un òs anomentat columella. Esquema de l’aparell auditiu d’una serp qualsevol. Imatge de Dan Dourson. La columella és un petit òs llarg i prim que està lligat mitjançant lligament i teixits cartilaginosos a la part posterior de la mandíbula superior i s’articula amb la mandíbula inferior. Les serps en tenen una a cada costat del crani i tenen una funció equivalent als estreps (òssos de l’oïda mitja dels mamífers). Les columelles estàn completament envoltades de teixits de manera que les vibracions, tant aèries com terrestres o aquàtiques, són tranmeses a aquests ossos, els quals es troben en contacte amb el líquid de l’oïda interna. Tot i així, la sensibilitat de les serps a les ones aèries és força limitada. Per exemple, mentre que els éssers humans podem sentir vibracions aèries d’entre 20 i 20.000 Hz, les serps només detecten vibracions entre els 50 i 1000 Hz. Tanmateix, tot i tindre un rang auditiu tant limitat, en algunes espècies de serps s’ha vist que l’aparell auditiu pot rebre estímuls vibratoris de qualsevol part del cos, ja que aquests es transmeten a través dels teixits fins a les columelles. Les serps aquàtiques com l’anaconda (Eunectes murinus) poden detectar amb tot el cos els sons d’animals movent-se sota l’aigua. Foto de Ddouk. Tot i les limitacions que tenen en detectar les ones aèries, el que se’ls dóna millor és detectar les vibracions provinents del terra o de l’aigua. La majoria de serps poden detectar amb gran precisió la vibració causada per les passes d’una presa arrepenjant la mandíbula inferior (que està en contacte amb les columelles) al substrat. L’escurçó banyut aràbic (Cerastes gasperettii) és una serp que viu en deserts sorrencs, on el terreny permet una gran transmissió de vibracions terrestres. Imatge de Zuhair Amr. Els ulls de les serps no difereixen gaire dels de la resta de vertebrats terrestres. Sí que tenen però algunes característiques especials, degut segurament als seus orígens subterranis o subaquàtics. La majoria de científics creuen que les serps van tindre que per dir-ho d’alguna manera, “reinventar els seus ulls”. Els ofidis més primitius, com aquesta serp cega europea (Typhlops vermicularis), tenen ulls petits i poc desenvolupats. Imatge de Kiril Kapustin. L’estructura de l’ull és pràcticament igual que en la resta de tetràpodes. Una diferència és el mètode d’enfoc que, mentre que en la resta de tetràpodes l’ull enfoca canviant la curvatura del cristal·lí, les serps enfoquen movent el cristal·lí endavant i endarrera. A més, mentre que quasi tots els vertebrats terrestres tenen parpelles que protegeixen l’ull, les serps tenen una escama ocular transparent que es renova cada cop que muden de pell. Serp ratera occidental (Pantherophis obsoletus) a punt de mudar de pell, moment en que l’escama ocular es torna opaca. Foto de Bob Warrick. Depenent de l’estil de vida de la serp la seva visió presenta adaptacions diferents, tot i que en la majoria d’espècies la retina presenta tant bastons (sensibles en condicions de poca llum) com cons (permeten veure els detalls i els colors). Les serps subterrànies més primitives presenten ulls força simples, amb només bastons que els permeten diferenciar la llum i la foscor. En canvi la majoria de serps diurnes presenten pupil·les rodones amb cons i bastons. Moltes serps arborícoles com aquesta serp fuet verda (Ahaetulla nasuta) presenten pupil·les horitzontals que els permeten augmentar el seu camp de visió, fent que puguin calcular millor les distàncies entre branca i branca. Foto de Shyamal. A part de la llum visible, algunes serps poden veure altres longituds d’ona. Els cròtals i alguns pitonomorfs (pitons i boes) poden detectar la radiació infrarroja, podent veure la signatura térmica del seu voltant. Això els resulta extremament útil per a detectar les preses en condicions de poca llum, ja que poden percebre la seva escalfor corporal. Fotos d’una pitó i un cròtal on es senyalen tant els forats del nas (fletxes negres) com les fossetes termorreceptores (fletxes vermelles). Imatge de Serpent nirvana. Això ho aconsegueixen mitjançant les fossetes termorreceptores, unes cavitats que han aparegut independentment en els cròtals i en els pitonomorfs. Mentres que els cròtals presenten només un parell de fossetes loreals a banda i banda del musell, els pitonomorfs en presenten vàries de labials en el llavi superior o l’inferior. Tot i tindre’n menys, les dels cròtals són més sensibles que les de les pitons. Esquema de l’estructura de la fosseta termorreceptora d’un cròtal. Aquesta presenta una membrana sensible als canvis de temperatura, darrera de la qual hi ha una cambra amb aire i nervis sensibles a l’escalfor. Aquest aire es dilata amb els increments de temperatura i activa el nervi trigèmin. Imatge de Serpent nirvana. Aquestes fossetes són extremadament sensibles i poden detectar canvis de temperatura de fins a 0,001°C. El nervi trigèmin arriva al cervell via el tectum òptic, fent que la imatge detectada pels ulls es superposi amb l’imatge infrarroja de les fossetes. Això fa que aquestes serps detectin tant la llum visible (com nosaltres) com la radiació infrarroja, d’una forma que a nosaltres ens resulta impossible d’imaginar. Vídeo de BBCWorldwide en el que se’ns explica com un cròtal de bosc (Crotalus horridus) utilitza la seva detecció de la radiació infrarroja per a caçar una rata en la foscor. Com heu vist, les serps perceben el món de forma molt diferent a la nostra. Les serps no deixen indiferent a ningú i, de la mateixa forma que diferents persones veuen a les serps de formes diferents, les diferents espècies d’ofidis presenten adaptacions diferents i diverses per a percebre el món que les envolta. Esperem que amb aquesta entrada hàgiu pogut entendre una mica millor l’increïble món en el que viuen les serps. Imatge de portada de Bernard Dupont. In my first blog entry I talked about the different kinds of snake that exist based on their dentition. In this entry, I’ll explain what species of ophidian we can find in the Iberian Peninsula, which species are venomous and which aren’t, and how we can identify the different species we can find when we are on the field. As we will see in this entry, snakes have been unfairly demonized, as the species in the Iberian Peninsula pose no threat to us. In the Iberian Peninsula we can find 13 different species of snakes, with representatives of three of the four types of dentition I talked about in my last post. There aren’t any proteroglyphous snake because the members of the Elapidae family are restricted to tropical and subtropical habitats. Most of the iberian species are snakes of the Colubridae family (aglyphous or opisthoglyphous) or vipers and adders of the Viperidae family (solenoglyphous). When we find a snake in the wild it’s important to know if that animal is a colubrid or a viper. Bites from Iberian colubrids are mostly harmless because they have either an unspecialized non-venomous dentition (aglyphous) or posterior venomous fangs (opisthoglyphous) which usually doesn’t inject venom and even if they do, normally they don’t inject enough venom for it to be dangerous. On the other hand, as Iberian vipers are solenoglyphous, they inject large quantities of venom, being vipers responsible for most of the snake bite accidents in Spain. Yet, bites are extremely rare, and most happen after a too prolonged manipulation of the animal. To identify a snake as a colubrid or a viper there are some anatomical characteristics which tell them apart. These characteristics are usually only applicable to iberian ophidians; species from outside the Iberian Peninsula may present different combinations of characters. The most cited character is the pupil. Normally vipers show an elliptic, slit-like pupil, while colubrids present a round pupil. However, this character is variable, because with low-light conditions a viper’s pupil may look round as the eyes of these animals can adapt to darkness. Colubrid with round pupil (ringed snake, Natrix natrix) and viperid with elliptic pupil (snub-nosed viper, Vipera latastei). Photos by Honorio Iglesias. The second character refers to the shape of the body. 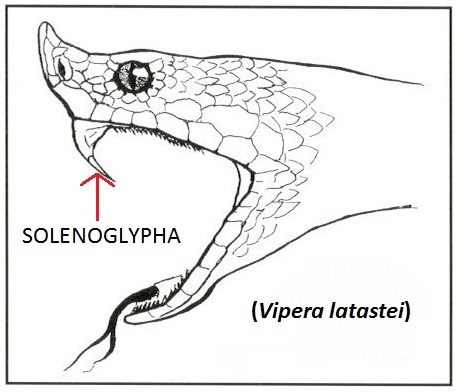 While colubrids are mostly thin, have an undifferentiated neck and a long slim tail, vipers have a triangular-shaped head with a neck differentiated from the body, and a short and conic tail. Although it may be difficult to look at, scales can be useful to tell colubrids and vipers apart. Vipers always present keeled scales, which have a little keel-like protuberance longitudinally on it. On the other side, even though they can have some keeled scales, most colubrids present smooth scales. Finally, while colubrids are active animals and usually flee before we can get close to them, vipers rely on their camouflage to avoid predation. Therefore, they stay still so we can’t see them, and may bite if they feel cornered. Coronella genus: Known as smooth snakes. In the Iberian Peninsula we can find the northern smooth snake (Coronella austriaca) which presents a dark mask-like spot covering from the nasal openings up to the neck and dark irregular markings on its back, and the southern smooth snake (Coronella girondica) which presents a pair of parietal marks and dark transversal spots on its back. Hierophis genus: The green whip snake or western whip snake (Hierophis viridiflavus) is a brightly-coloured snake with a pattern of black, yellow and green spots over its body. Even though they can grow up to 170 cm of length they are not venomous. It can be usually found from temperate forests to crop fields, and even in abandoned buildings. Natrix genus: Commonly known as water snakes due to their affinity for aquatic habitats. In the Iberian Peninsula we can find two species, the viperine water snake (Natrix maura) named after its zigzag marking and its keeled scales similar to a viper, and the grass or iberian ringed snake (Natrix astreptophora) which presents reddish pupils, an extremely variable coloration and a black “ring” in juvenile individuals. Viperine water snake (Natrix maura, left, photo by Honorio Iglesias) and iberian ringed snake (Natrix astreptophora, right photo of Fafner). Zamenis genus: The Aesculapian snake (Zamenis longissimus) is a slim, long and harmless colubrid with a characteristically narrow and elongated skull. It is normally found on forested areas, with different microclimatic variations to aid it on its thermoregulation. This species is the one represented coiled around the rod of Aesculapius and the Bowl of Hygieia, symbols of medicine and pharmacy respectively. Aesculapian snake (Zamenis longissimus) (left by Amiralles). Hemorrhois genus: The horseshoe whip snake (Hemorrhois hippocrepis) is an aglyphous colubrid that, even if it may bite if touched or grabbed, it’s not considered a venomous species. It presents a transversal mark on its head from one eye to the other, and another mark in the shape of a horseshoe on its neck, which gives this species its common name. It’s a species typical of rocky habitats. Horseshoe whip snake (Hemorrhois hippocrepis). Photos by Accipiter and Raúl León. Rhinechis genus: The ladder snake (Rhinechis scalaris) receives its common name due to the stripes that juvenile specimens present on their back, similar to a ladder, even though adult individuals may present only longitudinal stripes on their body without any transversal marks connecting them. Despite being an apparently aggressive snake, it rarely bites and is harmless to human beings. Ladder snake (Rhinechis scalaris). Photos by Matt Wilson (left) and by Fernando Fañanás (right). Macroprotodon genus: This is one of the few venomous species in the Peninsula. The western false smooth snake (Macroprotodon brevis) is an animal common on many different Mediterranean habitats. Even if it’s venomous, its small opisthogyphous mouth and its calm behavior make it totally harmless. It is characterised by a dark mark on the back of its head, and its short and flattened skull. Western false smooth snake (Macroprotodon brevis). Photos by Saúl Yubero and Amiralles, respectively. 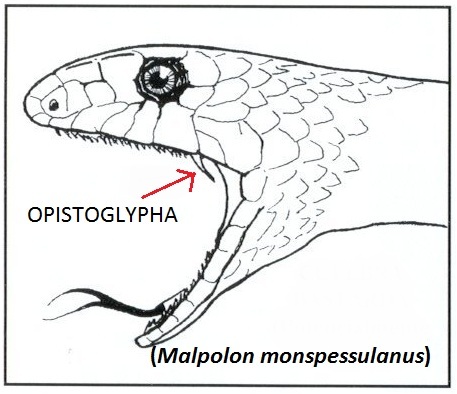 Malpolon genus: With specimens growing up to two and a half meters of length, the Montpellier snake (Malpolon monspessulanus) is the largest ophidian of the peninsula. Due to its opisthoglyphous dentition it normally doesn’t inject venom when biting (which is extremely rare), but larger individuals with much wider mouths may inject venom, but to cause symptoms it should hold its bite for a long period of time (most bites, even if rare, are dry warning bites). It is easily recognisable for its prominent eyebrows which give it a ferocious look. Montpellier snake (Malpolon monspessulanus). Photos by Herpetofauna and RuizAraFoto respectively. There’s only one genus of vipers on the Iberian Peninsula with three representative species. Vipers and adders usually have a wide and triangular head, a lightly elevated snout and usually present a zigzag pattern on their back which help them camouflage. The three Iberian species are venomous, but thanks to modern medicine, their ocasional bites aren’t harmful to human beings. The asp viper (Vipera aspis), the most venomous snake in the peninsula, presents grey, golden or yellow scales, with black or green spots. The snub-nosed viper (Vipera latastei) is the most common viper in the peninsula and its coloration varies from brown to grey. Finally the Baskian or Portuguese viper (Vipera seoanei) is a middle-sized viper and with a highly polymorphic pattern. 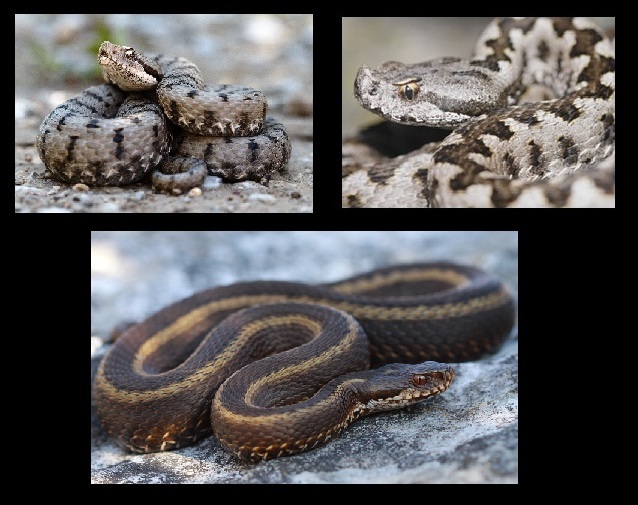 Asp viper (Vipera aspis, top left, photo by Felix Reimann), snub-nosed viper (Vipera latastei, top right, photo by Honorio Iglesias) and Baskian viper (Vipera seoanei, bottom, photo by Andre Schmid). As we have seen, snakes and vipers aren’t as bad as they are portrayed to be. Most species flee from human beings, and accidents and bites happen when we force them to interact with us too much. Also, ophidians help farmers and agriculturers by hunting and eating species traditionally seen as vermin. If we leave snakes and vipers alone, we will be able to enjoy the beauty of this animals in peace. If you enjoyed this article, please share it on social networks tospread it. The aim of the blog, after all, is to spread science and reachas many people as possible.